Residents and businesses are being asked to help with efforts to make this year's Illuminate and Thanksgiving celebrations the biggest and best yet. Forming part of the Mayflower 400 commemorations, the events – supported by the University and other organisations in the city – will be a fun but symbolic arts and heritage event which brings the Wampanoag Native American story to life. The Wampanoag were the tribe who supported the Pilgrim Fathers on their arrival in the New World and whose lands included what became Plymouth, New England, when the Mayflower landed. Without their support, it is doubtful whether the pilgrims would have survived to reap their first harvest, which is celebrated as Thanksgiving. On Thursday 24 November, audiences will be transported to a magical world, part parade and part performance, where community groups, schools and colleges transform themselves into imaginary tribes. Following a ceremony starting at 4.45pm with speeches, poetry, music and song at the Mayflower Steps, these tribes will process at 5.40pm from Commercial Wharf on the Barbican to the Guildhall telling the tale of Moshup the Giant as they go through illuminated costumes, lanterns, theatre and dance. This extraordinary character is central to the culture of the Wampanoag, and Moshup is believed to have been a benevolent being of gigantic frame and supernatural power, so enormous that he caught whales with his bare hands. 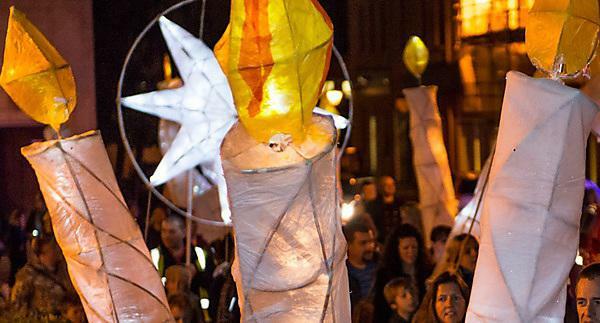 Illuminating the city as they go, the parade will pass near Plymouth Arts Centre where you can enjoy spectacular projections created by artist Megan Broadmeadow. Further fantastical digital projections will be displayed on the walls of the Guildhall for all to see at 6.30pm. At the opening and close of Illuminate and Thanksgiving 2016, Barbican Theatre's COMPANY b Dance and COMPANY b Theatre will perform pieces that provide powerful reminders of Native American culture and what their future may hold. Illuminate and Thanksgiving provides inspirational, inclusive and creative opportunities for children, young people and communities. This important event also connects Plymouth to the other Mayflower compact partner locations in the UK, Holland and Plymouth, Massachusetts who will also be holding Illuminate events. To achieve all this, partner organisations who are working hard to organise the event have turned to the crowd with the aim of raising £10,000 by 6.25pm on Thursday 24 November. Make your pledge at www.crowdfunder.co.uk/illuminate-2016 and help spread the word by posting about the crowdfunder on your social media pages using #Illuminate2016. "We want to make it a truly unforgettable evening and involve as many people as possible in this exciting creative process. The money raised will be used for the ceremony, the parade, school and community workshops with artists and the impressive projection display. Because we and our partners are passionate about co-production, the event will largely be produced in partnership with communities, schools and students from Plymouth College of Art and the University of Plymouth." "For Plymouth's third Illuminate to be the biggest and best yet and reach even more people, we really need the support of the city's residents and businesses. All pledges, whether small or large are hugely appreciated. In return, we're offering some fantastic rewards, including VIP tickets for the Illuminate and Thanksgiving reception, Mayflower souvenirs, and tickets for next year's glitzy Mayflower Ball." Illuminate and Thanksgiving 2016 is supported by the University, Arts Council England, Plymouth Culture, Plymouth and Devon Racial Equality Council, Plymouth City Council, Plymouth College of Art, RIO - Real Ideas Organisation, Plymouth History Centre, Plymouth Arts Centre and Plymouth Waterfront Partnership. As the 400th anniversary of the Mayflower voyage approaches, we are working with partners in the US, the city, local schools, and regions across the country. We are developing research projects and public engagement initiatives with all our partners to mark this historic voyage and its legacies. Further information about the Mayflower 400 celebrations.